With the purchase of premium Cisco Implementing Cisco IP Telephony and Video Part 1 (CIPTV1) certification practice exam, you will get 2 months unlimited attempt practice access with 100% Money Back Guarantee. Immediately after successful payment, you will get access to the following premium practice exams (Full & Mini). 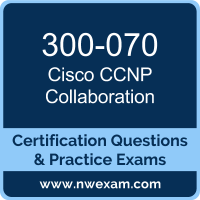 Both Full and Mini practice exams populate questions randomly from the same premium Cisco 300-070 questions bank which contains more than 360 questions. These exams are designed for your convenience and based on the availability of your time you can practice with any one of them. To achieve the best score in your actual Cisco 300-070, we strongly recommend you to practice as much as you can and clear your concepts and doubts from practice exam question answer. It will help you understand your areas of strength and weakness in related syllabus topics and improve your ability to answer tweaked and twisted questions in the actual Cisco CCNP Collaboration exam.